EVI low temperature air source heat pumps absorb low-grade heat energy from the air to provide domestic/commercial heating or hot water. They can also function as cooling devices in summer. 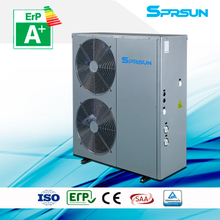 These cold climate heat pumps are developed using the Enhanced Vapor Injection (EVI) compressor technology and high-efficiency eco-friendly refrigerant, which ensures that the units can work normally at - 25℃ and supply heating in cold areas. In some areas, the lowest temperature in winter can reach minus 25℃. Under such a low temperature environment, it is difficult for ordinary air source heat pumps to maintain a good heating capacity. Low ambient temperature will lead to severe frosting of air source heat pumps, resulting in inability to start or unstable heating. It is recommended to use EVI air source heat pumps in cold weather. 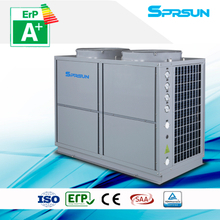 They apply special low temperature technology, special low temperature compressors and low temperature refrigerants to ensure normal start-up, stable operation and efficient heat supply under a low temperature environment. Now they are widely used in cold climate for heating and hot water supply.